First, a return to Jillian Michael’s Ripped in 30. I love Jillian’s exercise DVDs, and because they are organized in levels, I could choose which level of intensity to return to. I went with level #2 and will work to get back to level #4 over the next few weeks. These workouts are quick, but intense and make me feel like a badass, mostly because Jillian is yelling at me, telling me to be one the whole time. Second, I gave myself the gift of a 10 day pass to Harmony, my local yoga studio. For $10, I have had unlimited access to classes at the two studios. I took my first class in a heated studio, where the temperature is raised to 85-90 degrees. The vinyasa class includes music, great attention from the instructors and a calm, peaceful environment. The heat felt great on my tired and sore muscles. If you have the chance to take one of these classes post-marathon, go for it! During my second class, I even managed to get up in to “bird of paradise” pose! Victory! I’ll be continuing these classes over the next few weeks. I know they will be worth the investment of my time and money. 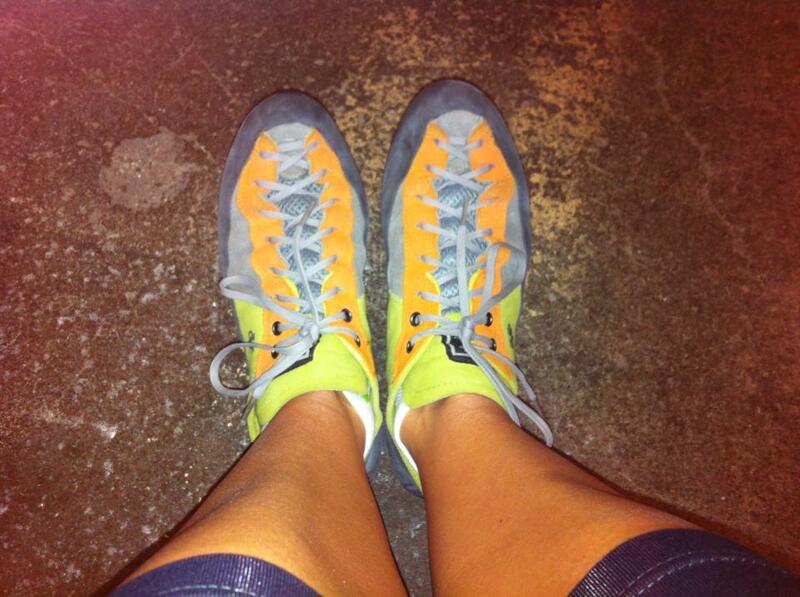 Finally, I crossed one more item off my 2013 Bucket List this week by finally going rock climbing! A friend invited Phil and I to go and generously offered to belay for us, since we had no experience. Though we couldn’t make this activity a date, we went on separate weeks and both loved it. I was thrilled to make it up my first attempt and only took one fall. I’ve got the bruise to prove it, but it was well worth it. There is something logical and puzzle-like about trying to find your way up a set of holds. It was also great to see the community effort at the Cleveland Rock Gym-friends belay for friends (now that’s trust! ), shouting encouragement and helpful tips up to them as they climb. The staff was welcoming and helpful and I even got to chat about marathon running with one of the employees. I’m sore today, especially in my forearms, but I’m already eager to go back. I hope your race recovery efforts are going well. What do you do in the weeks after a big race to recover?